Back in 2009, on our first trip, we embarked on one of the most amazing journeys in all of our travels. We based ourselves in the city of Alleppey and from there we went house boating through the stunning Alappuzhan backwaters. Arriving in Alleppey we had absolutely no idea where to start planning our trip. We had been on the beach for quite a while at this point and we were really enjoying our time in Alleppey. Most cities in India aren’t that easy to enjoy, but Alleppey was a nice change. 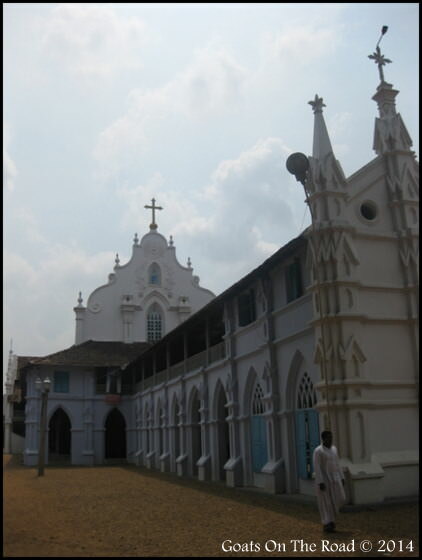 Considered the oldest planned town in the region Alleppey is the administrative headquarters of the Alappuzha District. We strolled the narrow lanes, ate in small roadside eateries and wandered around the shore of the backwaters in anticipation of the epic trip we were about to take. We were in Alleppey for the same reason that most tourists come here. For the chance to house boat through the stunning Keralan backwaters, which connect Kumarakom and Cochin to the North and Quilon to the South. Like I said, we had absolutely no idea where to start planning. Luckily the city of Alleppey is well prepared for uninformed tourists such as ourselves. We popped into one of the many travel agencies that lined the main street and they pretty much sorted us out from there. We decided to go with Ananda House Boats. After asking about 2 dozen questions, the friendly agent called us a taxi which took us to the boat to have a look. Right from the moment we stepped foot on the boat, we knew we had made a good choice. This house boat was absolutely stunning. It was two levels. The top level had a beautiful, open sun deck with a comfortable bed overlooking the water, while the lower level had two rooms, a bathroom, a living room, a dining room and a tv! We never thought that we’d be sailing in such style! What really sold us on our house boat was the crew, which consisted of three smiley, friendly and enthusiastic Indian men named Vikram, Baboo and Kumar. They’re smiles were so contagious that we knew that they were exactly who we wanted to sail with. If you need more help planning other tours, trips and excursions around Kerala, check out the Kerala Tourism Website. We awoke the morning of our planned trip, packed our bags and went outside where our ride was supposed to meet us. Sure enough there was a tuk-tuk right there waiting and we were on our way back to the beautiful house boat that we checked out a couple of days before. When we pulled up at the docks, Vikram, Baboo and Kumar were happily waving from the deck of the boat. We boarded the floating home and put our backpacks in our room. The room itself was literally one of the best rooms we had ever had in India. Vikram, our cook, started us off with a couple of coconut drinks which we carried with us as we excitedly toured the boat that we’d be living on for three days. Our house boat was the typical rice barge style boat that you see all over the Keralan backwaters. I must say that ours was one of the classier boats on the water. Our room was gorgeous! A dark wood headboard and wall mounted end tables centered the room with a massive bay window that spanned one entire wall. The bathroom was nice too and it even came with hot water! We cheaped out a bit and opted for no A/C which meant that the fuse for the unit was turned off, but we figured that being right on the water the nights would be blissfully cool. 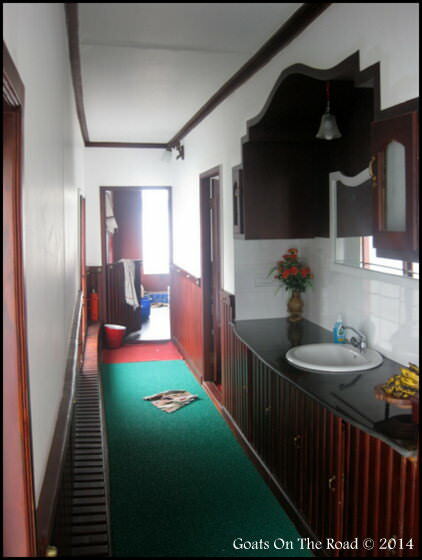 The hallway between our bedroom and the living/dining area was also finished in dark mahogany and the a sink and washing area was on one side, all with beautiful finishings. The living room / dining room was perfect. There was a table big enough to comfortably seat six people, a couch and coffee table and a small LCD TV (which was rare to see in India in those days). Upstairs was the most beautiful part of the boat and it is where we spent most of our time. An exquisitely decorated relaxation area complete with a couple of lounge chairs and a massive sun bed which had perfect, near 360 degree views of the passing backwaters. We were living in complete luxury and all on a backpackers budget! The backwaters of India are a huge network of brackish lagoons, lakes and canals lying parallel to the Malabar Coast of the Arabian Sea. The area is fed by 38 rivers and consists of a half-natural, half-manmade network of waterways that span half the length of the Kerala State. The backwaters consist of 205 kms of stunning rivers that were traditionally navigated for cargo shipments and passenger transport. On our journey we would travel from northbound from Allepey for 3 days and 2 nights. We passed beautiful, water-side villages where traditionally dressed locals harvested rice, washed their laundry and prayed on the jungle fringed shores. We stopped in a few of the towns and visited some temples, churches and markets along the way, but most of our time was spent enjoying the views from our boat’s sun deck, lazily watching the peaceful Indian backwaters slowly pass us by. On one night we asked Vikram (our cook) if he knew of somewhere to buy a bottle of wine. Without hesitation, he hollered back to our driver Baboo and within seconds the boat was steered ashore. “Come” Vikram said as he signalled us with the strange, backward hand motion that we’ve learned to desipher in India. We followed him through the jungle overgrowth and up to a bridge road where we waved down a Tuk Tuk (again with an Indian hand motion that I can’t explain). We hopped in our rattling ride and it took us into the nearest village about 5 minutes away. The rickshaw came to a screeching halt right outside of a liquor store. We hopped out quickly but Vikram was way ahead of us. He ordered us our wine and by the time we reached the Caged window, all we had to do was pay the price that was on the tag! We made our way back to the boat and that night we cracked our bottle of “wine” which actually tasted like warm grape juice. We laid on our backs on our sunbed and gazed up at the billion or so stars that graffitied the dark night sky. Just as we were finishing our last drops of the now delicious red wine, the sky became ablaze with fireworks. The village that we had just bought the wine from was celebrating a festival and we were able to enjoy the sound and light show from our floating home. The sound of crickets, frogs and leaves rustling in the bushes were accompanied by the odd flash of light and brilliant display in the sky. The backwaters of India, truly an amazing (and relaxing) adventure. After 3 amazing days on our houseboat we came to realize that the best part was our crew. 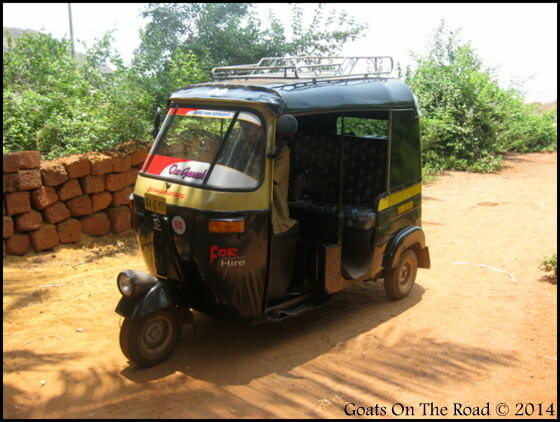 Vikram, Baboo and Kumar were the friendliest, happiest, most considerate Indian men we had ever met in our travels. Vikram was an incredible chef. He cooked us 3 meals a day, all of which were amongst our best meals in the country. How he managed to conquer such culinary feats from the cramped kitchen space on that boat is beyond me. Baboo was a great captain and we’re not sure what our “engine man” Kumar did, but he was definitely a joy to be around. We awoke every day with tea, and ended the day in the same fashion and we couldn’t have asked for better people to sail with for 3 days. This is definitely something I’d like to do when we get around to visiting South Asia – I think this style of travel would suit us! Nick, you look so young and fresh faced in these pictures – I think I’m still used to seeing you full bearded after your Central Asia trip, so it comes as a shock! If you guys can get around to it, i think you would really enjoy it. 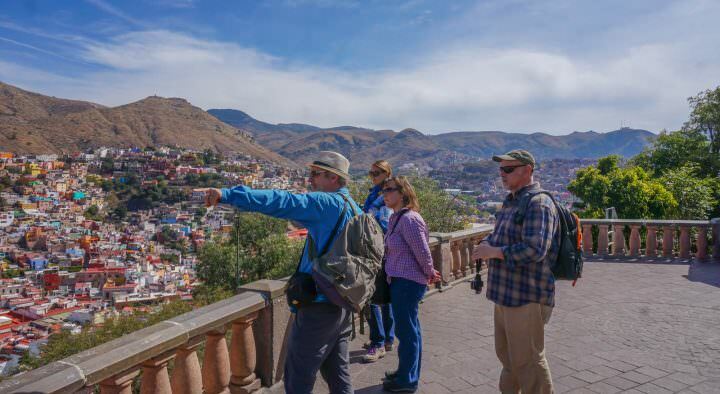 Our experience was very luxurious, relaxing and fabulous! How much was your backwater boat trip? We are travelling to Kerala – arriving in April – as part of our year away (And our first stop in India), and would love to have this experience too, but we are on a tight budget – Ananda House Boats’ website cites over $100USD for 1 night on the boat – is this a typical cost for this type of excursion, or will we be able to find a cheaper alternative upon arrival do you think? I highly recommend waiting until you’re in the city to book your trip. We looked at quite a few boats and at quite a few companies before deciding. You want to see what you’ll be getting, and who your “staff” will be. 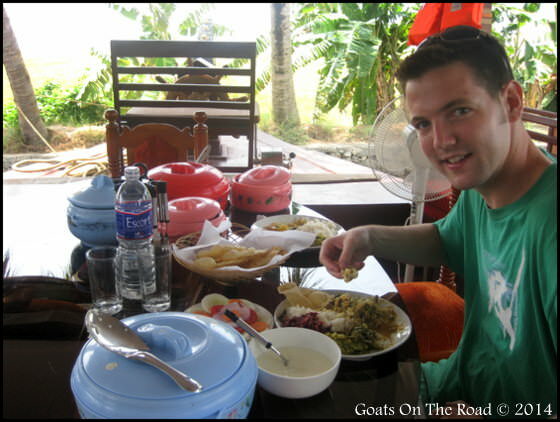 When we went on this trip in 2009, the cost was something like $70/night, including food, guides, boat, everything. Boats vary, as do costs. I was just wondering what company you used for your house boat package, I am looking to do the same thing and it would be nice to have a recommendation? 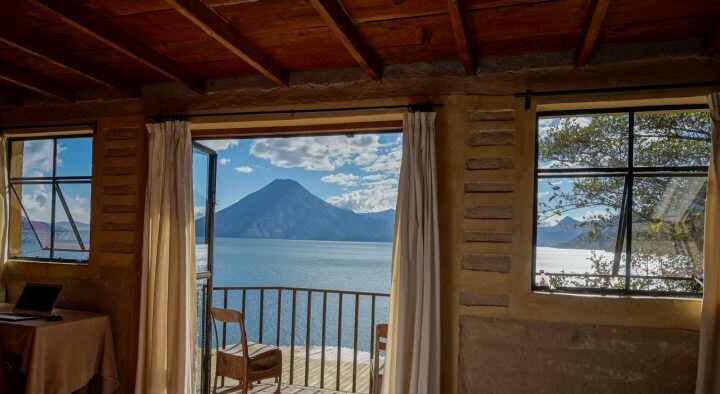 We went with Ananda Houseboats…but definitely make sure to have a look at the boat before agreeing to anything – they can vary! So – more leeway on the clothing (or lack there of) on the houseboat? On the beaches in the south of India, wearing a bathing suit is normal. I have a friend that has done something similar! Adding to the bucket list! 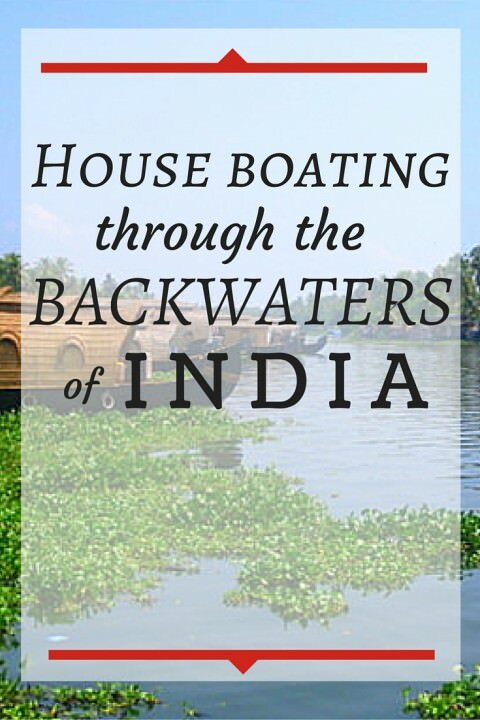 The backwaters is indeed a unique experience. The views and atmosphere are absolutely serene. 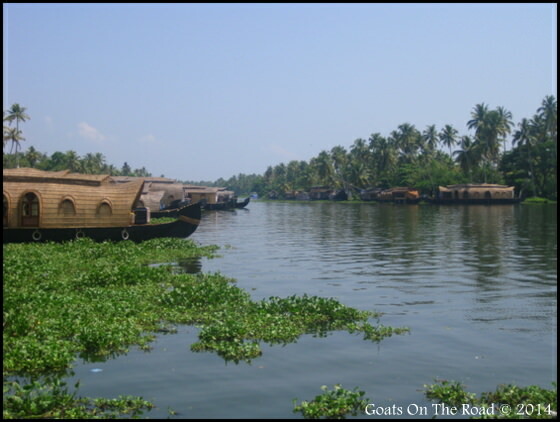 Great Post…Alleppey backwater offers tourists a potpourri of scenic flavors to savor optimally. I enjoyed backwater tour in Kerala…..Thanks for sharing such great type of article,It ‘s will be beneficial for first time traveller. 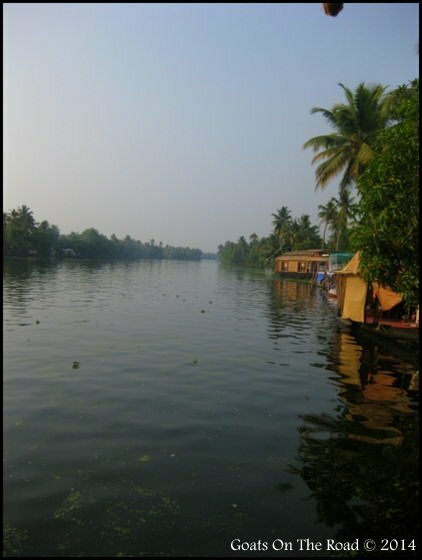 In my life, I have seen the first blog on a backwater of Kerala with such brief details from start to end and nice pic. What a fantastic post! I always love ready your blog, but this is probably my favorite so far. 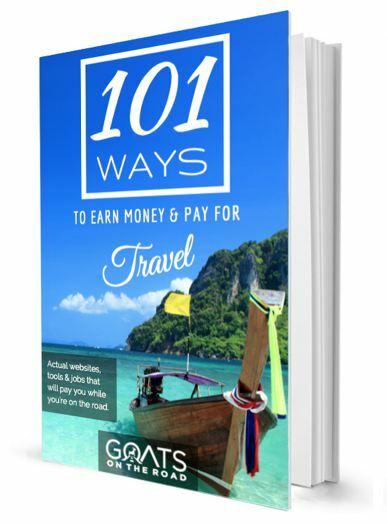 You’ve inspired me to start planning my next trip. Thank you! I am an Indian living in mumbai but never got any chance of going kerala and a house boat stay there I have heard alot about this though, but this article now made my mind n I am gonna go there for my next holiday. 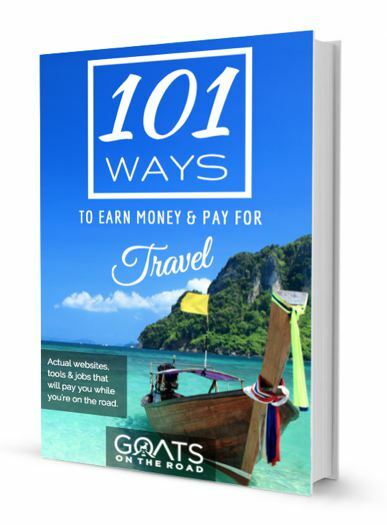 Thanks for writing this and helping me to decide my upcoming holiday destination. lol..